The University of Toledo College of Medicine and Life Sciences and ProMedica are collaborating on a joint Neurosciences Center that will advance education, research and care for patients with neurological disorders. Set to open in April, the new facility is a state-of-the-art, three-story, 122,000-square-foot building on the north campus of ProMedica Toledo Hospital. It features academic facilities for students, residents and faculty, as well as centralized services for neurology and neurosurgery, including physician clinics, radiology, diagnostics, rehabilitation therapy and a research clinic. 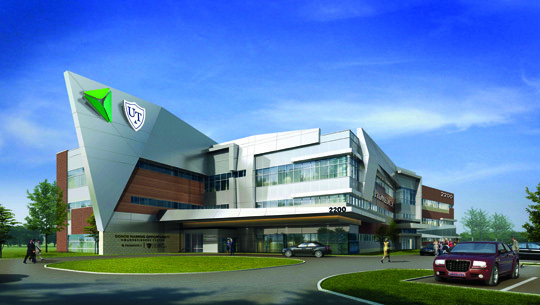 The joint Neurosciences Center, shown in this rendering, is scheduled to open in April. The innovative partnership, which is an expansion of the Academic Affiliation between the University and ProMedica, will bring together UT faculty, physicians and researchers with ProMedica physicians in a single location to improve the quality of life for people living with disorders of the brain, spine, nerves and muscles. The direct interaction between scientific researchers and clinical staff will provide patients the latest and most promising treatments for their conditions and provide students, residents and fellows a wide variety of experiences to enhance their education in an interdisciplinary setting. The joint Neurosciences Center will advance treatment for common disorders, including stroke; epilepsy; headache; movement disorders such as Parkinson’s, Alzheimer’s and other dementias; multiple sclerosis; and vestibular disorders that cause dizziness. The center will be led by UT’s Dr. Gretchen Tietjen, Clair Martig Chair and Distinguished Professor of Neurology, and ProMedica’s Darrin Arquette, senior vice president for Neurosciences, Heart and Orthopaedics Institutes at ProMedica. The joint Neurosciences Center builds on successful previous collaboration between UT and ProMedica to create a comprehensive stroke program in the region that provides lifesaving interventional therapies for patients with acute stroke and non-surgical treatment of brain aneurysms. This entry was posted on Wednesday, February 14th, 2018 at 3:36 am and is filed under Medicine and Life Sciences, News, UToday .